Top 10 Tattoos of the week – Edition #29- Find the best tattoo artists, anywhere in the world. 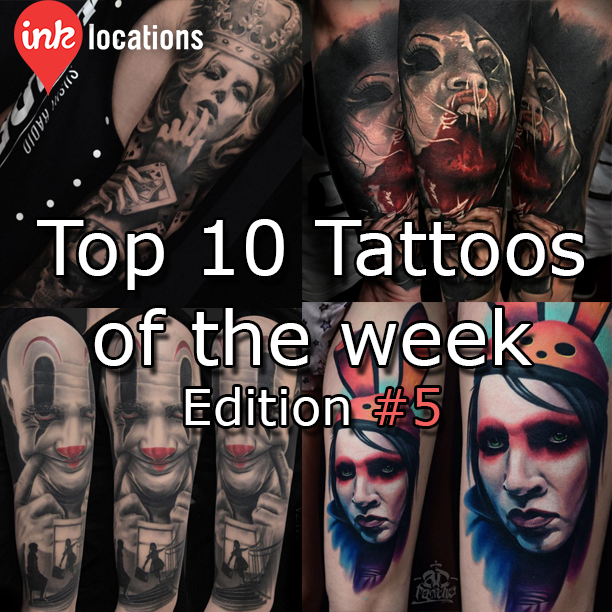 Welcome to the twenty–ninth edition of InkLocation’s Top 10 Tattoos of the week! This week features Alex Wright (@thealexwright), Antonina Troshina (@_rostra_), Den Yakovlev (@den_yakovlev), Deran Hall (@deranhall), Greg Nicholson (@evilkolors), Joe Frost (@hellomynamesjoe), Matt Jordan (@mattjordantattoo), Robert Ekman (@robertekmantattoo), Rodrigo Kalaka (@rodrigokalaka), Vid Blanco (@vidblancotattoo). As usual, if you see an awesome tattoo that was completed during the next week – send it through to [email protected] or tag us @inklocations #inklocations to get it in the running to be featured in next weeks edition! Finished the outside of this sleeve the other day, now onto the inside! thanks again Andy! 2 sessions in a row, #worldfamousink #barberdts #rocknrollforever #london #southampton #vidblanco #skull #skulltattoo #gold #golden #goldenskull #realistictattoo #inkjecta sculpture made by amazing @jackofthedust ?? If you enjoyed this post, don’t forget to subscribe below to receive these directly to your email each week! Subscribe to turn your inbox into an inkbox!